Served cool from 500ml bottle into straight pilsner mug. L) Medium amber, clear, a few bubbles coming up. Very thin white head, not impressive for the style. S) Not a lot, light lager malt perhaps. 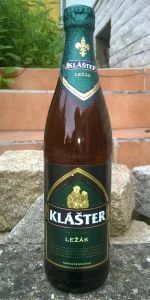 T) A good if muted Czech pilsner taste, definite but subtle sweetness to the malt, definite but subtle hop bitterness. Bready in the aftertaste. F) Body and carbonation is right for the style; moderate carbonation, a certain gravity in the mouth. Can't be faulted here. O) Another good Czech pilsner. On the light side of the flavour spectrum perhaps. A: The beer is clear light yellow in color and poured with a two finger high white head. A very slight amount of carbonation is possible. S: There are light aromas of bready malts in the nose. T: The taste has lots of rich, malty flavors. D: The beer is very drinkable and goes down easily. Pours hazy light orange/yellow with large fluffy head that slowly fades to dense white layer and keeps till the end of the glass, downsliding lacing. Aroma is grassy hops and bready malt. Taste is simple light sweetish malt with grassy hops and semi-dry finish. Light body with moderate carbonation. Very drinkable and pleasant Bohemian lager.